Bluetooth authentication is a method that has emerged to address these needs by actually enhancing convenience and productivity for end-users. Bluetooth is an open standard for short-range radio frequency communication that has been integrated into many types of devices, including smartphones, laptops, automobiles, medical devices, and home appliances. Bluetooth authentication combines location-based Bluetooth Low Energy (BLE) technology with two-factor authentication to enable users to effortlessly lock and unlock their computers as they approach or leave. Here’s how it works: When a user is within Bluetooth range of his or her computer, the computer registers the signal from the user’s Bluetooth-enabled device—such as a smartphone, token, or wearable—and wakes up. A notification window pops up on screen, and the user inputs a password or PIN to access the computer. The registered Bluetooth-enabled device and the password/PIN are the two factors in the authentication process. The system can also be configured so that the computer automatically locks or logs the user out when he or she moves out of Bluetooth range. This prevents unauthorized users from taking advantage of an unlocked and/or unattended computer. Bluetooth authentication automatically wakes the computer up when the user approaches and locks the computer when the user leaves, meaning users don’t have to waste time waiting for computers to boot up or worry about remembering to lock them when they’re done. Users also don’t have to worry about entering usernames and randomly generated passcodes—they just need a passive, Bluetooth-enabled device and an optional password or PIN to verify their identity. All of this adds up to an almost frictionless user experience that enables users to get to work more quickly and easily, without sacrificing security. 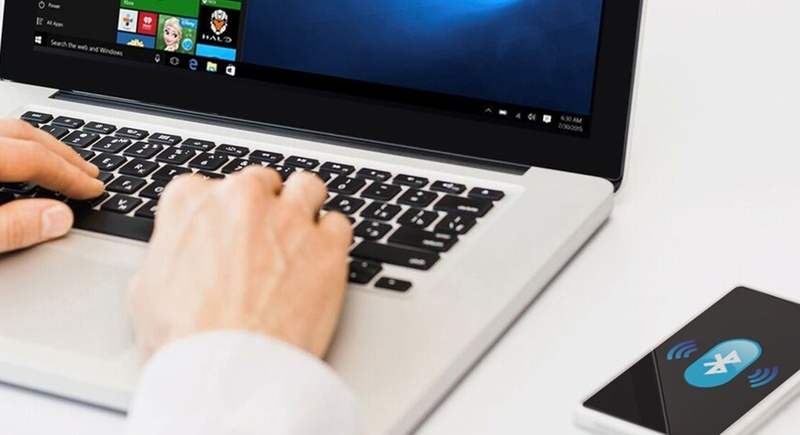 Because a user’s computer is automatically locked when they walk away, Bluetooth authentication eliminates the risk of someone accessing a user’s unattended and unlocked workstation. Bluetooth is built into many devices, so companies have the option of leveraging users’ existing mobile devices instead of purchasing hard tokens when implementing Bluetooth authentication. This is more cost-effective for the organization and convenient for the user. Bluetooth authentication is dependent on a user’s device having a charge, so if the device’s battery is dead, the user cannot authenticate using this method. In the event that the battery dies while the user is authenticated via Bluetooth, the the user’s computer will lock or log the user off when the signal is lost. However, there is an optional setting that can be used to avoid this scenario. When the optional setting is used, the user simply receives an on-screen notification enabling them to choose not to log off. Bluetooth is proximity-based, so if a user leaves his or her workstation, but is still within Bluetooth range, the workstation will remain unlocked. While there is the ability to adjust the signal range, it is not based upon exact distance, but rather signal strength. If you set the range to “near,” it will only connect when the signal is strong and will disconnect if the signal weakens. However, if the range is set to “far,” a user is able to stay connected even when the signal is weak. Of course, a user must carry a Bluetooth-enabled device with him or her in order to authenticate. If the user loses or forgets the device or if it is stolen, he or she would be unable to authenticate using this method. Adding a second factor, such as a PIN or password, keeps a user protected in the event that the device is stolen. While Bluetooth authentication can save money by leveraging a user’s existing smartphone or mobile device, the company or user would have to buy a BLE dongle for Windows PCs (about $5 each). Depending on how many employees there are, this could get expensive for the enterprise. Mac users wouldn’t have to worry, however, because Macs have built-in Bluetooth. Is Bluetooth Right for Your Organization? Bluetooth is an authentication method that helps address user convenience and security concerns in the modern workplace, while enabling users to be more productive in less time. Additionally, it takes advantage of devices users already carry, which means cost savings for the company and wider user adoption.